The first thing to understand about Duro-Last is it’s a brand name for a well known, reputable roofing product with a proven history of long lasting value and durability. The value of a Duro-Last roof is in the simple fact is inexpensive to install comparative to other roofing options, requires very little maintenance other than an obligatory inspection on occasion, and lasts well beyond the timeframe you might typically expect before having to replace the roof. A membrane is the essential part of any flat roof. There may be gravel or rubber on top of the membrane and there may be nails or glue holding the membrane in place. Ultimately, anything else is there to protect the membrane and maintain its functionality, as the membrane itself is the roof that protects the inside of the building from weather. 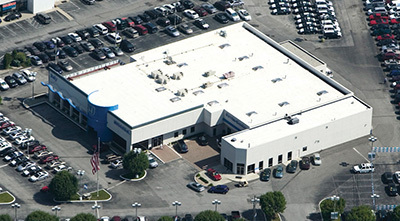 TPO, or Thermoplastic roofing systems, is a product known to be well planned, designed, and manufactured to provide years of service to your building. The process incorporates environmentally friendly concepts while producing a roof membrane which can expand and contract through weather extremes rather than drying out and becoming brittle and susceptible to physical damage. Rubber roofing membranes, on the other hand, work a little differently as to how they perform the same function as a TPO membrane. A TPO membrane “works smart” to finesse the weather away, a rubber membrane works hard and strong to keep the weather off your building. In most cases, either option will work well for your needs. The best idea is to discuss with your roofing contractor which is going to be the best solution for your specific project, and trust his expert advice as a being a result of experience and knowledge.